Mission San Juan Capistrano, around which Father Francisco Maynes acquired land. Painting by Hermann Lungkwitz, 1856. Francisco Maynes was a Spanish-born Catholic priest and occasional military chaplain who served in Texas in the early 19th century under Spanish, and then Mexican, rule. Maynes proved quite successful in petitioning the San Antonio town council for land that belonged to the former Spanish missions, thus establishing a precedent for local clergymen to become land speculators. 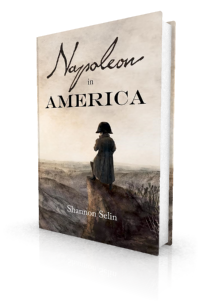 In Napoleon in America, Father Maynes insists he is ready to give his life to prevent Napoleon from entering San Antonio. Francisco Manuel Maynes was born on November 5, 1761 in the province of Soria, Spain, the son of Juan Maynes and Maria Cruz Utrilla. He was ordained in 1793 in Seville. Maynes liked to be addressed as Bachiller, the honorific title of a secular priest, in recognition of his university education. At some point Francisco Maynes travelled to New Spain (Mexico). In 1808, he was appointed as a chaplain to the presidial and “flying” (mobile) companies of Texas and Coahuila. These were the military formations manning the garrisons (presidios) and frontier outposts of this vast region. Military chaplains were responsible for celebrating mass on feast days, administering the sacraments, performing marriage ceremonies for soldiers and officers, and accompanying the troops on expeditions. In 1808 Francisco Maynes began his service at Atascosito, a Spanish settlement and military outpost on the Trinity River near the site of present-day Liberty, Texas. In August 1809 he was transferred to Santísima Trinidad de Salcedo, a small military-civilian settlement on the east bank of the Trinity River, near present-day Madisonville. In February 1810, when the Spanish government solicited a donation of funds for defence, Father Maynes was one of the largest contributors from Trinidad. Later that year, Texas Governor Manuel Salcedo visited the eastern frontier and asked Father Maynes to provide a written report on his pastoral charge. Maynes characterized the Spanish inhabitants of Trinidad as loyal subjects of their King and country, devout Apostolic Roman Catholics, breeders of horses, mules, cattle, and hogs, and planters of corn, beans, pumpkins, watermelons, and other crops. The foreign inhabitants he stated were more prone to live in the country than the town and preferred hunting, breeding horses, mules, cattle and hogs. They cultivated corn, beans, watermelons, pumpkins, greens, and some cotton. Some were devoted to drinking when they came to the settlement, but they were generally peaceful and respectful of the country and the Catholic religion. In January 1811, the Mexican war for independence reached the province of Texas. A retired militia captain named Juan Bautista de las Casas led a successful coup d’état in San Antonio de Béxar (present-day San Antonio) and arrested Governor Salcedo. When the news reached Trinidad, the settlers declared themselves in favor of Casas. Because of his friendship with Salcedo, Father Maynes was arrested and taken to San Antonio. Though his property was seized, Maynes was otherwise treated with respect. Casas was soon toppled and Maynes was released. In 1813, Trinidad was destroyed in revolutionary violence and Father Maynes moved to Natchitoches, Louisiana where he became the priest of St. Francis Catholic Church (Maynes mistakenly appears in some transcribed Natchitoches parish records as Father Francisco Magnes). In 1817, he caused a church to be built at Alexandria, Louisiana. Francisco Maynes remained in Natchitoches until after Mexico gained its independence. In 1822, he was again appointed as a presidial chaplain, this time to the San Antonio military company of Alamo de Parras. He arrived in San Antonio in November 1822. Since Father Refugio de la Garza, priest of the San Antonio parish (San Fernando), was on a leave of absence from 1822 to 1824 as a Texas delegate to the Mexican Congress, Father Maynes also assumed pastoral care for the parish. In addition to administering the sacraments, he was responsible for endorsing the citizenship of Protestant American settlers who sought to become Mexicans by marrying Mexican women and converting to Catholicism. In August 1823, Texas empresario Stephen Austin tried to secure Francisco Maynes’ services for his colonists. He petitioned Texas governor José Antonio Saucedo. There were no missionary priests available. The dissolution of the Franciscan missions in Texas, which had started under Spanish rule, was completed with an 1823 Mexican directive requiring “full and complete secularization.” (6) The directive reserved only the church buildings for the diocese. The San Antonio ayuntamiento (municipal council) assumed the job of distributing the land, water rights and tangible assets of the abandoned missions. Frontier priests were poorly paid. They often added to their meagre earnings through secular activities such as ranching. Francisco Maynes thus joined the scramble of applicants petitioning the ayuntamiento for land. 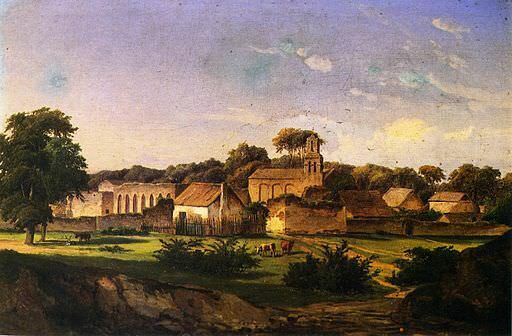 In 1824, he received one of the most generous land grants at Mission San Juan Capistrano, south of San Antonio. In 1827 he augmented his holdings at the mission. Maynes may have set a precedent, as Father Garza – notorious for neglecting his spiritual duties – also enriched himself in this fashion. Late in life Maynes adopted an orphaned immigrant, Jacob Linn, who was born in Bavaria in 1825. Jacob’s parents had died on the voyage to Texas, and his sister died shortly after arriving in San Antonio. Father Francisco Maynes died in September 1834 at the age of 72, the victim of a cholera epidemic. He left the majority of his estate to young Jacob. Jean L. Epperson, “Trinidad de Salcedo: A Lost Texas Town,” Journal of the Houston Archeological Society, Number 107 (December 1993), p. 19. William Stuart Red, The Texas Colonists and Religion, 1821-1836 (Austin, 1924), p. 33. Eugene C. Barker, ed., Annual Report of the American Historical Association for the Year 1919: Vol. II: The Austin Papers, Part 1 (Washington, 1924), p. 680. The Texas Colonists and Religion, 1821-1836, p. 35. Félix D. Almaráz, Jr., “San Antonio’s Old Franciscan Missions: Material Decline and Secular Avarice in the Transition from Hispanic to Mexican Control,” The Americas, Vol. 44, No. 1 (July 1987), p. 4. Father Maynes, chaplain of the company of Bexar and...who speaks the English and French...will set them a good moral example...and instruct the youth in the dogmas of the Roman Catholic religion.